flower pattern in blues, greens, purples and pinks. Craft is one of the most universal and least manageable symptoms of chronic illness. 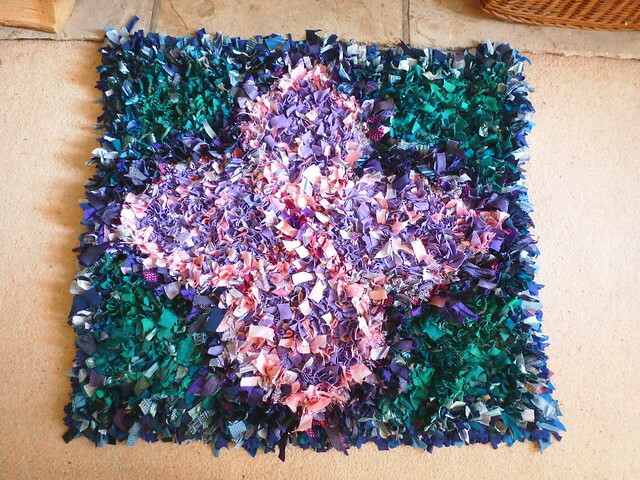 Stephen and I have been quite unwell throughout much of January and thus have had enough time when we weren't able to do anything more useful, in which to produce a rag rug. There were many scraps of nice fabric left over from my wedding dress and other sewing projects, plus I had a small collection of old clothes which were too worn out for selling or donating - jersey tops which were stretched, had holes in or splodges of paint on them. Naturally, we had to accept that any rug we made was coloured in the the same palette as my wardrobe. loops of fabric sticking through. 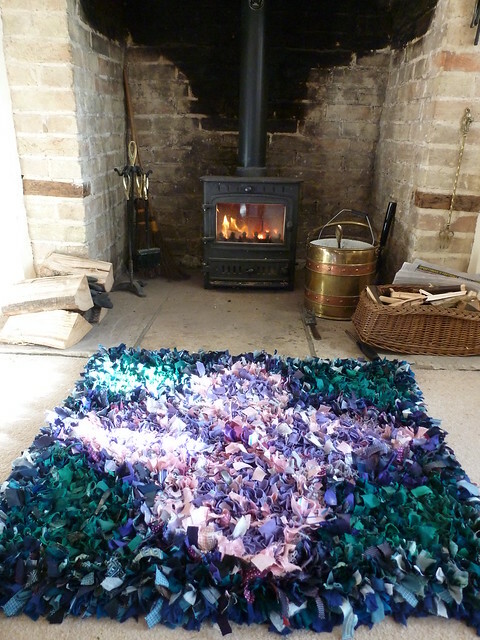 To make a rag rug, you need some hessian sacking (£2.50 a metre, including postage) and a load of waste fabric, cut into small strips. You force the strips through the weave of the hessian, then back up again, and secure with a knot. Granny says the knots are unnecessary, but I imagine she may have done a neater job in wartime than we could manage. 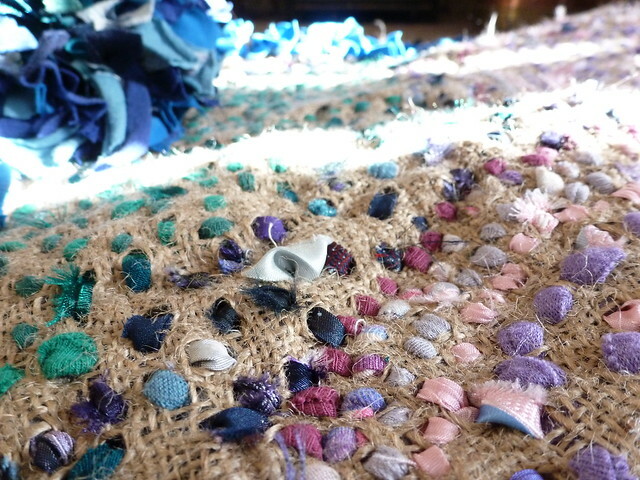 Close up of the rug texture. I bought a cheap wooden tool called a proddy from eBay but we gave it up pretty quickly for an ordinary pencil. A pencil does just fine and if you're sat in bed and lose it until the covers, you can always find another pencil. Our bed is generally full of pens and pencils. 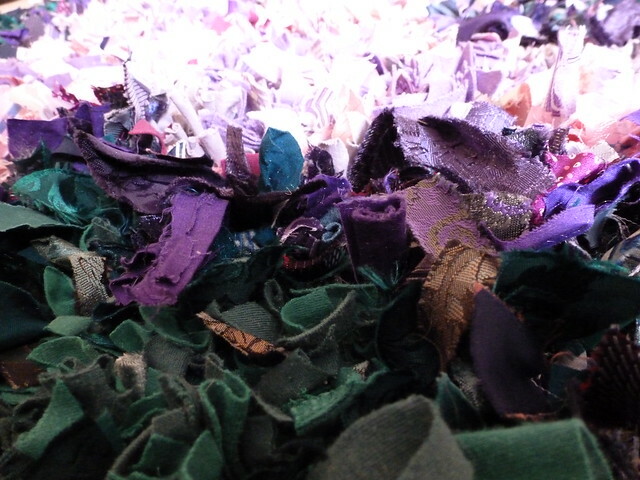 Rag-rugging uses a lot of fabric; there are six jersey tops in this, as well as significant remnants of similar fabric. Jersey, or t-shirt fabric, is particularly good for rag-rugging because (a) most of us wear a lot of it and these garments do wear out and (b) there's stretch in the fabric, so while it can be a bugger to sew with, it's easy to pull about and tie knots in. There are all kinds of fabrics in this rug, including stretch velvet, flannel from some old pyjamas and silk from some of the ties, but most of it is cotton jersey. There's absolutely no skill to rag-rugging at all and the only point you need to concentrate is to avoid cutting off your fingers when using scissors. It is, however, a very compelling activity, so anyone has to be careful with doing too much of it in one stretch, especially while listening to a really good audiobook (mostly Under The Dome by Stephen King).